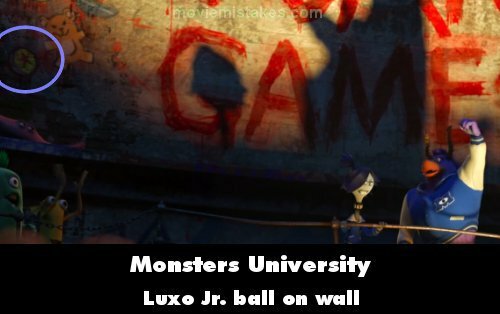 Continuity mistake: In what is supposed to be a time-lapse scene, we see the Monsters University campus as nighttime ends and the sun rises. The shadows of the trees and buildings never change position as the sun gets higher in the sky. Continuity mistake: In the scene when Mike is at the school door lab. When he swipes the access card the door swings out. But when the campus police try to get in it is blocked from the inside, indicating the door opens inwards. 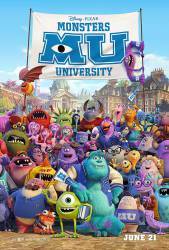 Other mistake: Towards the beginning of the film, the teacher counts 19 students then says one is missing, implying there are 20 (including Mike) However, Mike ends up being paired with the teacher, despite there being an even number of students and therefore everyone should have a partner. Continuity mistake: At the start of the scene where OK arrives at the ROR house for the mid-game party, it is obviously dark inside except for flashing blue and purple lights, seen through the windows. However, when the OK gang enter the house, it isn't dark anymore and the blue and purple lights are gone. Continuity mistake: When Mike and Sully move into their bedroom at the fraternity house, the door opens inwards. When they fall through the doorway, it opens outward. Mike Wazowski: I've been waiting for this my whole life! I'm gonna be a scarer! A Pizza Planet truck is parked next to the party house when Mike arrives on the mascot pig.